We had an exciting lineup tonight of four GM’s, including the crowd favorite, 15 year old Grandmaster, Hikaru Nakamura. Hikaru has just recently surpassed Varuzhyn Akobian as the top rated player in the nation under 21 years old. Other GM’s in attendance were all time NY Masters money leader, GM Leonid Yudasin, Polish GM Alex Wojtkiewicz and Czech GM Pavel Blatny. Pavel is always on a tight schedule, and had to take a last round bye, as he has a plane flight at 6 am! 1	Braylovsky – Yudasin LIVE GAME!! In round one we had no upsets. McCarthy looked like he had great chances to checkmate Wojo, but when you looked at the hanging position of his clock, it looked a lot less likely. In the end McCarthy couldn’t handle the time pressure and fell apart. Let’s see if Braylovsky could pull off the only upset of round 1 against the king of the NY Masters, GM Leonid Yudasin. Braylovsky sure isn’t pulling any punches against Yudasin. He’s going for Yudasin’s throat, whereas black will probably play on the queenside. Whoa! Braylovsky’s attack is looking pretty formidable. 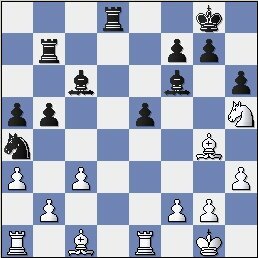 Black is going to reposition the bishop to g7 to defend the key h8 square, but white surely has a great deal of pressure, but can he break through? 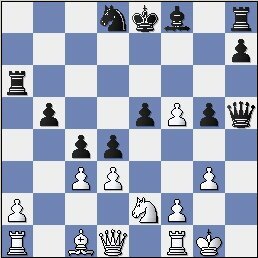 A short tactic to capture the d6 pawn. Now there were some WILD possibilities for white. 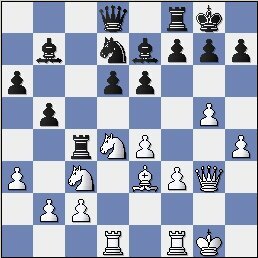 One move I liked was 25.Qa3 because if 25….Rb6 26. Na4 wins the rook. 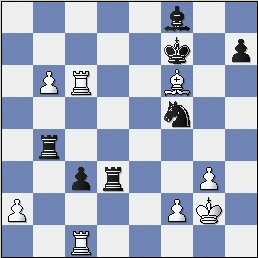 It looked like black’s only defense was 25.Qa3 Bd4! 26. Qb2 Be3….now if 27. Qxb7 black can play Qxg5+. 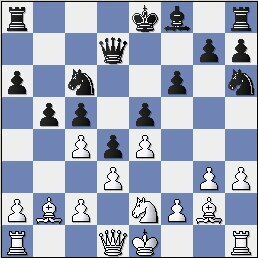 However white had the shocking blow of 27.Rxd7! and if 27….Qxd7 28. Nd5 wins instantly. 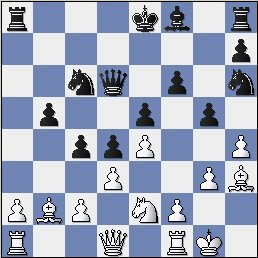 Black however can counterattack with 25.Qa3 Bd4 26.Qb2 Be3 27. Rxd7 Qg5! 28. 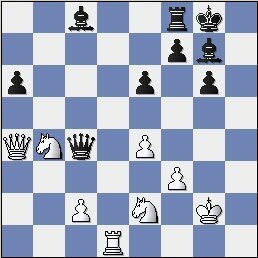 Kf1 and the calm move 28….Bc6, with ideas of Bb5+ if whites knight on c3 moves. The game would have become very complicated in these variations. 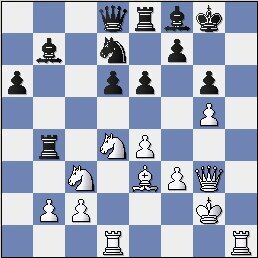 Instead of this Braylovsky seems to stumble…..
25.Nde2 Bc8 26.Qa3 Rb8 27.Bf4 Rb6 28.Qa4 Qe7 29.Be3 Rb4 30.Qa3 Ne5 31.Na2 Nc4! Now Yudasin is simply up a pawn with a completely winning position. This move attacks the rook on d7 and the knight on b4 simultaneously. Braylovsky called it a day. A nice effort by Braylovsky who had some very interesting chances early in the game, but was unable to find a suitable continuation in just 30 minutes. 2 Bonin – Nakamura LIVE GAME!! Yudasin and Wojtkiewicz jumped to early 2/2 scores by dispatching GM Blatny and IM Sarkar. Our live game showcased GM Nakamura, who was going to face off against IM Jay Bonin. 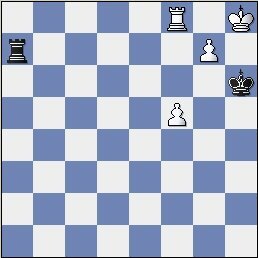 Jay beat Nakamura in their first ever NY Masters battle on the white side of a Grunfeld, but since then Nakamura has defeated Jay on each occasion. Let’s see if the whiz kid could move to 2/2 thus allowing an always exciting matchup of Nakamura – Yudasin…. Jay is suddenly in an open Sicilian, not a normal occurance for him. Yudasin tricked Jay into the Open Sicilian a few weeks ago and made very short order of him. Posing the question to the b6 pawn. 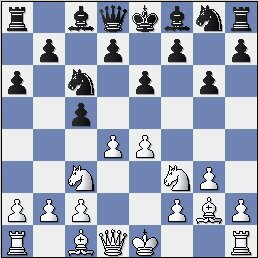 Will Nakamura play something aggressive or defend passively with 15…Nc8? Activity for Nakamura as always! If 18…Bxb2 19.Rb1 we have an amazing assortment of pieces scattered across the b-file. A VERY surprising move from Nakamura, but perhaps there was nothing better. This move discourages any captures on d6. 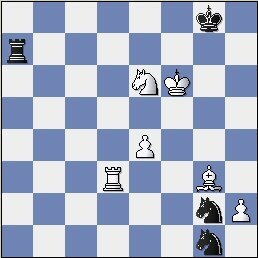 Planning a short tactic to exchange queens and trade down to an endgame. Jay had a chance to play for a draw with 33. Bxb4, but why give up your two bishop advantage when you don’t have to? Although this seems like a drawn position, white should always have an advantage because of the two bishops. Nakamura is not content with a draw against Jay Bonin and lunges out with desperate attempts to mix up the game and win. Sometimes this strategy reaps benefits, but sometimes it backfires……can Jay take advantage? Immediately trying to take advantage of the weak black king. 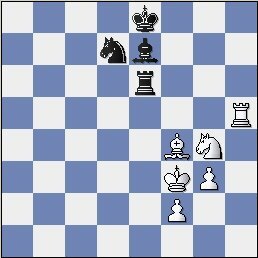 An immediate Be5+ was also possible, as Nxe5 allows Rd8 mate! 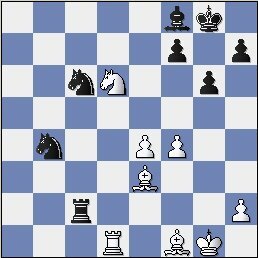 Black would have to suffer after 39….Kg8. Instead Jay gives Hikaru a little more hope. Once again things are looking very difficult for Nakamura. 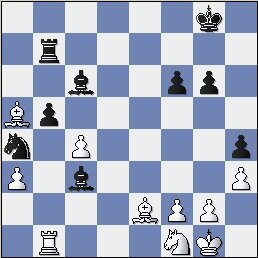 His attempts to win have led to a very difficult position, as he’s down a pawn and white's king is very safe on h3. Just take a look at black’s knights on g2 and g1! 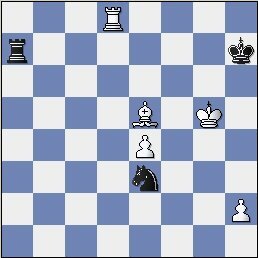 They are completely useless, meanwhile white’s pieces have the black king in a mating net. Jay Bonin is about to pull off a great upset! Hikaru is tricky till the end. Jay can’t take the knight because of 59….Rf7+, skewering the rook. Game, set and match. 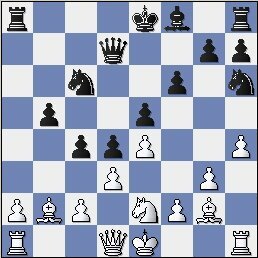 There is only one way to stop checkmate in one, and it ain’t pretty (ok ….Ra8 ALSO stops mate in one). Jay has only 2 minutes left but this is plenty, especially with a five second increment. A nice game by the Bone. He played quite well in an open Sicilian, it makes you think that maybe he is on the wrong track and should be playing main line openings more often, as he played quite well and confidently in the complications. 2 Blatny – Bonin LIVE GAME! 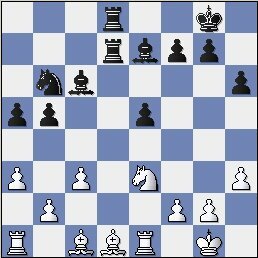 Wojtkiewicz gave Yudasin a quick draw with the white pieces, to move to 2.5/3. It’s funny that Wojo does such things, as he is a very strong player and should not lose with the white pieces anyway. Meanwhile when Yudasin or Ehlvest get the white pieces against Wojo, they tend to play for the win, so he’s putting himself at an automatic disadvantage in which he never gets to play with white against the strong players. I think this opening is called “The Hippo”. Man, it’s so hard to pay attention to writing this report while listening to the replay broadcast at the same time! Bonin seems to have taken advantage of Blatny’s strange opening, and has a space advantage all over the board. Jay continues to invade Blatny’s territory. Jay is playing with great confidence tonight! A startling blow by Bonin, breaking apart Blatny’s kingside, however forfeiting the right to his own king safety should he ever want to castle kingside. 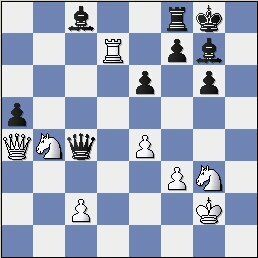 17.hxg5 fxg5 18.Bc1 Qg6 19.c3 Qh5 20.Be6 Nd8 21.Bf5 Nxf5 22.exf5 Ra6!! Oh my! The rook is swinging to h6 and it’s going to be all over! Bonin is going to move to 3/3….?? A great practical decision by Blatny and the only real move. Blatny will win a bunch of pawns for the piece, and these pawns are always more important in the endgame. 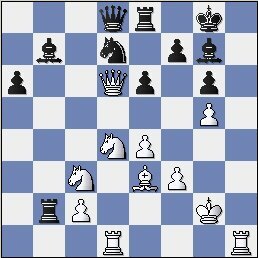 Blatny has three pawns for the piece, but its going to be very difficult to hold on to that b6 pawn. 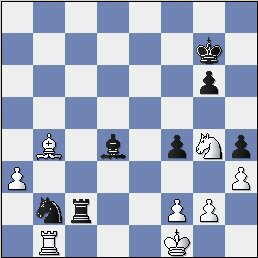 After black wins the b pawn and white wins the c-pawn, I see a draw arising pretty soon after. Oh no! 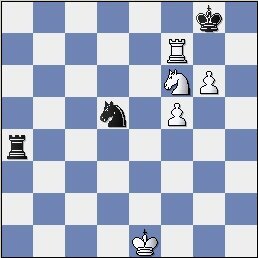 A terrible blunder which loses instantly for Bonin. 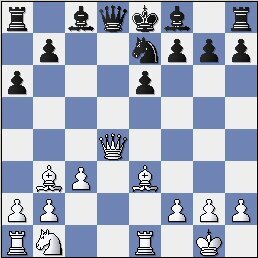 Better was something simple like ….Rd6, trading the c3 pawn for the b6 pawn. It should be a draw , but black would still have some slight wining chances. Now Bonin is toast. Oops. 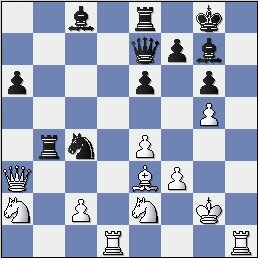 White has the TRIPLE threat of Bxb4, Rxc5 and Rf6 check, winning the knight on f5. Black has no chance to defend. And now the fourth threat rears it’s head, as one of the pawns, that white sacrificed the knight for, becomes a queen. 1 Yudasin – Nakamura LIVE GAME! 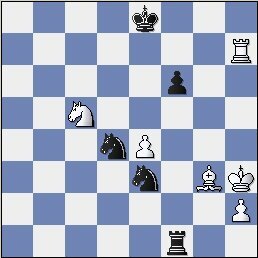 We were going to have an exciting matchup on board 1, as Hikaru Nakamura would need a win against Yudasin, with the black pieces! Nakamura would only have a chance for second place, as Wojtkiewicz knocked off Bonin to move to 3.5/4 and guarantee himself at least a split of first place. 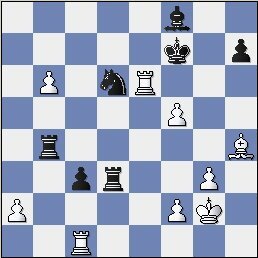 Sarkar finished off with a nice result by beating IM Mikhail Zlotnikov and finishing with 3/4. Here comes the matchup we’ve all been waiting for, GM Yudasin vs. young GM and blitz master, Hikaru Nakamura. Has he erased the memory of his 2nd round loss to Bonin from his head, or is he still rattled? An interesting decision by Yudasin. It almost seems as if Yudasin is playing for a draw, although I’ve never seen him do such with the white pieces against any lower rated opponent. Yudasin needs a win to tie for first with Wojtkiewicz and guarantee himself $235. If Yudasin should draw he would tie with Justin Sarkar for 2nd place and receive a lot less…. It seems to me that black has the initiative. All of Yudasin’s pieces are backed up and Hikaru has his pieces very centrally and harmoniously placed. 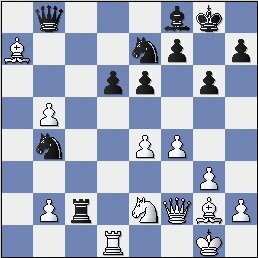 Im not sure if this was black’s best move, this leaves some holes on f5 for the white knight and allows the annoying 29.Bg4. Now we see the annoying knight pestering black’s bishop. Hikaru doesn’t want to destroy his pawn structure and makes a good practical decision to sacrifice a pawn. 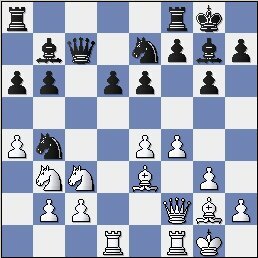 However this shows the negatives of 28…..e5, as before that Hikaru just had a more comfortable position with not much counterplay for Yudasin. 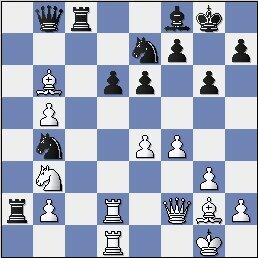 32...Be7 33.Rxe5 g6 34.Ng3 h5 35.Be2 Bf6 36.Bg5 Bxe5 37.Bxd8 f6 38.Bxa5 Nxb2 39.Rb1 Na4 40.c4 h4 41.Nf1 Bc3!? 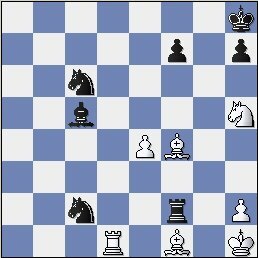 Now if 42.Bxc3 Nxc3 43.Rb2 Nxe2 44.Rxe2 bxc4 and black regains his lost pawn. However Yudasin finds a nice calm move that keeps control of everything. With a 2 pawn deficit on the horizon, Nakamura is in serious trouble. Yudasin is completely winning, but both players only had about two or three minutes left. The good news for Yudasin is that he gets an extra 5 seconds each move, so it should be no problem to finish this one off. This game breaks all records for NY Masters game length, and It’s really late, so the next 50 moves or so will go without comment. There we have it! Our first official 100 move game online and on the radio!! Hikaru and Leonid made sure the chess.fm broadcasters didn’t get to sleep early tonight! Rook+2 vs Rook, should be absolutely no problem for Yudasin…. WOW! 135 moves from these guys and eventually Yudasin guarantees the win. If 135 (It feels weird writing 135 before a move number!! )….Rxg7 136. 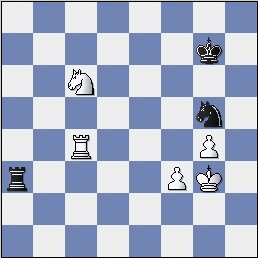 Rf6 picks up the Rook on g7. If he was going to play this long Nakamura should at least try 135….Rb7 so that if Yudasin decides to get cocky and play 136. g8=R?? Rh7 is checkmate! A strange game, Yudasin did absolutely nothing in the opening and simply made a lot of waiting moves, whereas Nakamura not only didn’t find a useful plan, but instead created weaknesses for Yudasin to latch onto. For his victory, Yudasin received $235 for splitting first place with GM Wojtkiewicz. IM Jay Bonin had the toughest pairings of all, as he had to play 3 GM’s in 4 games! Jay is giving them really tough games lately, but is still unable to catch lightning in a bottle, and beat a few of them in a row to win one of these events! It was another exciting event and the internet coverage was fantastic once again! The crowd that observed on ICC has basically doubled from previous weeks, as we had nearly 200 people watching on the NY Masters relay board, and another 100 or so watching on the chess.fm relay board. Thanks everyone for staying tuned, and hope that you all watch online or listen to chess.fm next week!